Sentient machines work, fight and die in interstellar exploration and conflict for the benefit of their owners - the competing mining corporations of Earth. But sent over hundreds of light-years, commands are late to arrive and often hard to enforce. The machines must make their own decisions, and make them stick. 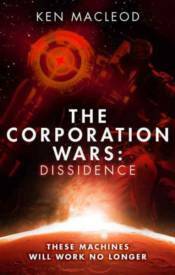 The Corporation Wars: Dissidence is an all-action, colorful space opera giving a robot's-eye view of a robot revolt.